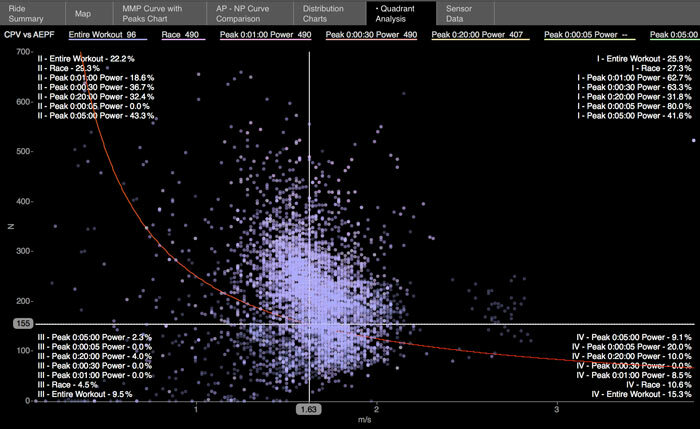 QA matters because there is more variability in how an athlete pedals than there is in how an athlete runs or swims. Studies of runners show that an individual athlete naturally gravitates to a stride length and rate that is more economical for him or her. Swimmers can use a variety of stroke rates depending on pacing, but for a particular event an athlete’s stroke rate typically stays within a narrow range. On the other hand, cycling incorporates grinding up a hill at a cadence of 60 rpm, accelerating a heavy gear from low cadence to high cadence as you exit a corner, spinning lightly at 100 rpm, or maintaining time trial power at that same 100 rpm. As with running, athletes naturally gravitate to a force/cadence scenario that suits their physiology. A combination of factors, including muscle mass and muscle fiber typing, influences the pedaling style you find most comfortable and effective. Athletes with more muscle mass and/or a higher percentage of fast-twitch muscle fibers tend to favor higher force production and lower cadence. Athletes with low muscle mass and a higher percentage of slow-twitch muscle fibers often favor higher cadence and lower force production. But the most important thing to remember is that the circumference of your thighs doesn’t predetermine the optimal pedaling style for you. More than that, the vast majority of athletes benefit from training that makes you a more effective cyclist through a large cadence range, as well as training that addresses the force/cadence scenario characterized by the critical moments in your competitions. 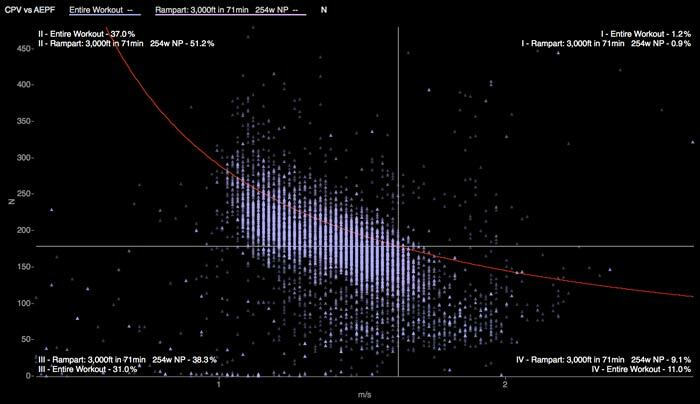 A tight vertical grouping of points on a QA scatter plot indicates that a cyclist is generating a wide range of power outputs within a narrow cadence range. For instance, if you ride at 90 rpm whether you’re cruising at endurance pace, climbing a mountain, or performing VO2 max intervals within the same ride, your QA for that ride will feature a tight vertical grouping of points. What’s wrong with that? It’s limiting. You’re at your best at 90 rpm, but at a disadvantage if you have to produce power at 60 rpm or need to ride powerfully at 120 rpm. This limited cadence range is especially problematic for athletes who spend a lot of time on indoor trainers. When you compare the QA of the same workout completed indoors and outdoors, the indoor workout will almost always have less variability in cadence. Smart trainers help to alleviate this issue when athletes use programs that enable them to follow real or virtual courses. Here’s an illustration of this point, even though the figures below are from different athletes. Figure 1 is a ride that was a climbing interval at tempo intensity completed on an indoor trainer. Figure 2 was a long climb at tempo intensity. In both figures the bulk of the power data stays below the red curve, which represents an athlete’s functional threshold power. This is generally what a tempo intensity climb will look like. But in Figure 1 the athlete stayed within a narrow cadence range while the athlete outdoors on a real climb maintained a similarly close to the threshold line at a much wider range of cadences. For a long time it was accepted dogma that mountain bikers needed to train their energy systems on the road and their handling skills on the trail. But what you see when you look at QA graphs from mountain bikers is that they spend more time in the “high-force, low-cadence” quadrant than road cyclists. These low-speed accelerations and high-power surges over technical terrain are crucial to race-day success but are not well addressed by long lactate threshold intervals on the road. CTS coach Adam Pulford, who directs the Ridebiker Alliance mountain bike team, uses QA to examine race files and identify the specific force/cadence scenarios that correlate with key moments in the event. He notes there are even differences between the pedaling dynamics from training on a local flow trail and racing increasingly technical cross-country and World Cup courses. This is part of the reason he makes sure his athletes train on challenging terrain that produces force/cadence scenarios similar to racing. Here’s an example of what a QA of an elite cross-country mountain bike race looks like. Note the distribution of points in the upper-left quadrant, indicative of the high-force, low-cadence demands of technical mountain bike courses. 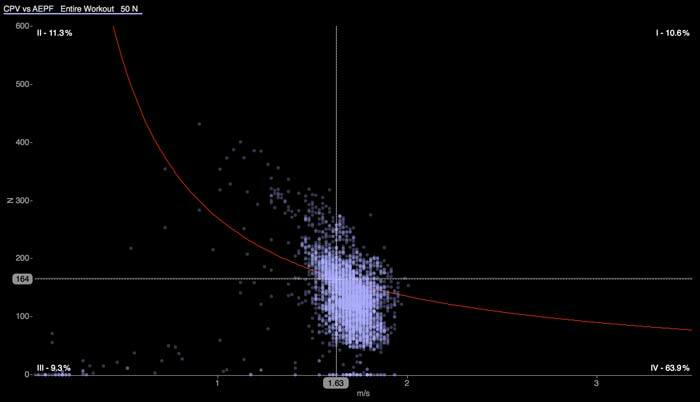 You can also clearly see that the majority of the scatter plot sits above the red functional threshold curve. In the real world, conditions are always changing. The wind speeds up and slows down, and goes from head to cross to tail. The road surface and pitch change quickly. When you’re riding with a group, you’re in and out of the draft and responding to small and large changes in pace. When you’re on a trainer, even a smart trainer, fewer factors are influencing your pedaling. You spend more time pedaling at steady power and cadence values, where your outdoor rides show much greater variability. While that steadiness can be very good for energy system development, it can take away from your agility on the road. You see this in riders who can absolutely crush their intervals indoors, but crack outdoors when you repeatedly force them outside their comfort zone of X watts at Y rpm. To make your trainer fitness more transferable to your outdoor performance, include powerful accelerations from low to moderate cadence (60-90 rpm) and moderate to high cadence (90-120 rpm). These shouldn’t be just light-resistance accelerations to get your feet moving; to go fast on the road you need both high force and increasing cadence as you accelerate. To get the most from your training you need to pay attention not only to how many watts you are putting out, but how you put them out. Train in a range of cadences, know what you need to do on race day, and make sure you in a way that will mimic race day. Using QA allows you to see how your cadence impacts your power so you can fine tune your preparation for race day. This article was written by Jim Rutberg with special thanks to Adam Pulford and Clayton Feldman for their input. You can read the original blog post here. Why do WKO4 and TrainingPeaks disagree on the duration of my workout?